I, like most of you, have seen the promos for CREED with an incredibly buffed, perfectly toned Michael B. Jordan and suffered immediate salivations. The steam ended there. I think he’s a good enough actor. I’ve supported all of his films in part because I’m raising a young black male child and his endearing image needs to be seen in film. 5. The stellar cast. Sylvester Stallone, director Ryan Coogler, (who also gave us Fruitvale Station), Phylicia Rashad, and a sultry and alluring Tessa Thompson come together to tell a story of rich history in the world of boxing, love, defeat and triumph. It’s a beautifully intertwined depiction of legends and rookies and the hearts of the undaunted. 4. Michael B. Jordan’s body. I promised myself I was not going to mentally mute out his speaking parts when he was shirtless. I succeeded and even my kiddo could not eat his nachos until at least 20 minutes in… Yes, it’s that entertaining from minute one! 3. This story of love beyond fault, beyond death, beyond forgiveness is one every woman who has ever dealt with infidelity should see. When a woman loves a man, she truly loves everything he’s created. This is one of the most powerful layers in the film, beyond the obvious. Okay, no spoilers. 2. 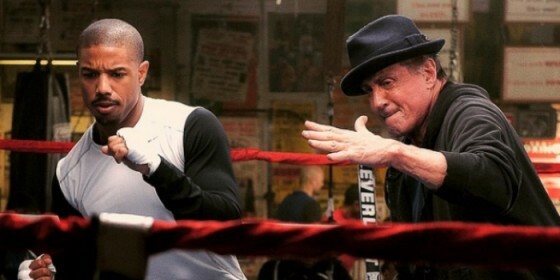 CREED will remind you to fight, not specifically in the ring, but in life in totality. Fight for your legacy, for your passions, fight for your fears to prove to yourself you’re worthy. So often we are reminded why we should give up. We see something that looks defeating and we cower to it just because it makes sense to quit or not even try. This film will inspire you to defy the odds placed before you as well as those you’ve placed on yourself. 1. This film reminds us that family does not limit us to blood, that we can create and align ourselves with those who’ve been placed in our lives to push us, nurture us, heal us and grow us. This holiday season will be heavy for many. So many people are challenged in with families, in their finances, in their hearts and spirits. While this film alone will not cure the ills of all, it’s a gentle reminder that we can have the love, the life and fulfill the promise in our blood to reign. That allowing love in, by saying ‘Yes, I can and I will fight for what I believe’, our lives will be enriched with wins, despite our wounds. I’m A Comeaux and I am a fighter, survivor and I’m saying Yes to the challenge because even if I don’t win, I’ll be remembered as a helluva contender. Get your blog delivered to you! Type your email address in the box and click the "create subscription" button. Six Brown Chicks' list is completely spam free, and you can opt out at any time.